Hey, are you on the lookout for a multivitamin and testosterone booster? We can’t blame you – both are imperative for today’s bodybuilding enthusiast. How about sizing up a product which gives you the benefits of both? Enter GAT MENS MULTI + TEST. The name is enough to tell you this is no ordinary multivitamin – we’re confident men will love it. Tribululs fruit powder content. Helps improve sexual function and increase strength and endurance. Practical. It’s like buying a multivitamin and testosterone booster. Side effects. Some customers say it causes niacin flush, a burning and tingling sensation in the face and chest. Suggested Use: As a dietary supplement, take one (1) serving, two (2) tablets, daily with a meal. We think men’s multivitamins with testosterone support are awesome. Anybody who thinks otherwise is out of his mind. Hey, these supplements not only fill nutrition gaps, but they also help ramp up endurance and boost sexual function. Case in point: Optimum Nutrition OPTI-MEN. This product’s 50-milligram Virility Blend consists of saw palmetto extract, damiana extract, panax ginseng extract, ginkgo biloba extract, nettles powdered extract, pumpkin extract, and raw oyster concentrate. If these don’t boost your virility, nothing will. We hope we can mention GAT MENS MULTI + TEST in the same breath. This multivitamin “is a complete vitamin, mineral, and energy multivitamin with added men’s virility ingredient Tribulus terrestris,” per its official website. “MENS MULTI + TEST offers athletes solid support for nutrient deficiencies they may need with an added testosterone support,” per the same source. Better overall health and improved sexual function? Meet the Men’s Multivitamin With Testosterone Support. 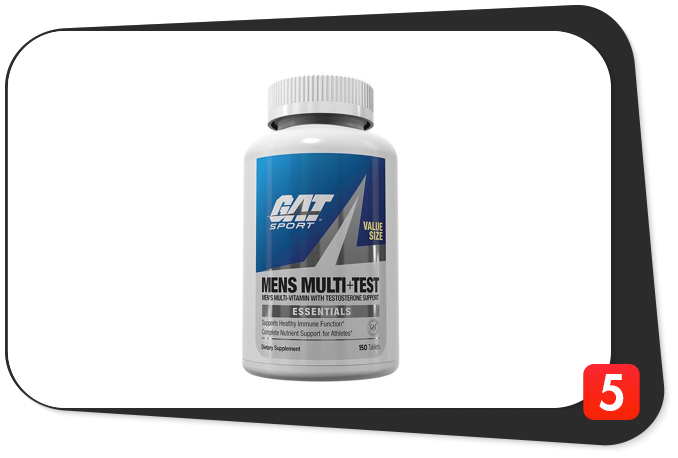 At first glance, GAT MENS MULTI + TEST’s ingredients are comparable to those found in a regular men’s multivitamin. You can find the usual high B vitamin amounts (but not as high as an athlete multivitamin’s such as EFX Sports VitaDrive), minerals, and the like. In short, we found nothing special about the usual multivitamin components. The first thing we look for in a multivitamin is an “ISO-Certified” or “All-Natural” label. “Good Manufacturing Practices (GMP) are guidelines that provide a system of processes, procedures, and documentation to assure a product has the identity, strength, composition, quality, and purity that appear on its label,” per NSF.org. 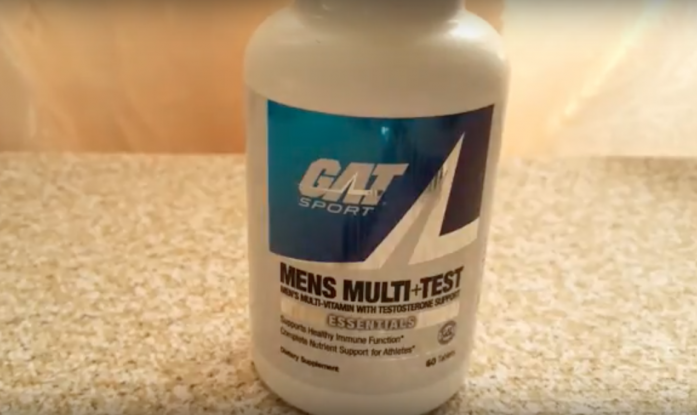 The clear takeaway: GAT MENS MULTI + TEST has no synthetic ingredients. It’s clean from top to bottom. Like we said, GAT MENS MULTI’s vitamin and mineral components are nothing out of the ordinary – the individual ingredient amounts are common. On the bright side, they should fill those nutrition gaps quite nicely. In general, B vitamins help increase energy levels and boost heart health. You’re sure to reap these two crucial benefits with GAT MENS MULTI + TEST. On the other hand, we’re also stoked this product has vitamin D (50 percent DV), vitamin K (100 percent DV), chromium (100 percent DV), and copper (100 percent DV). Many multivitamin manufacturers overlook these four ingredients. With these around, you will strengthen your bones and immunity, ward off nasty free radicals, regulate your blood sugar levels, and increase your energy levels, among other things. Now, if you thought Optimum Nutrition OPTI-MEN’s 50-milligram Virility Blend can make a difference, wait until you get a load of GAT MENS MULTI + TEST’s tribulus fruit powder component. How does an impressive 500 milligrams per serving grab you? Take our word for it: this much is rare for a men’s multivitamin. Just so you know, Tribulus terrestris is a plant whose fruit and roots boost male virility. Clearly, the sexual benefits speak for themselves. On the other hand, tribulus fruit powder’s ability to increase testosterone levels bodes well for overall strength and muscle growth. Ask any veteran bodybuilder. We dare you. Plus, the modern man feels wiped out at the end of the day. Such is life. Tribulus fruit powder should help offset that. We’re confident 500 milligrams per two-tablet serving will do the trick. GAT MENS MULTI + TEST not only improves sexual function, it also boosts your long-term health, for sure. Its additional components (citrus bioflavonoid peel powder complex, grape seed extract, green tea leaf extract, spirulina powder, etc.) serve as hard evidence. Unfortunately, these are part of GAT MENS MULTI + TEST’s Proprietary Blend – the company fails to break down the individual ingredient amounts. To sum things up, GAT MENS MULTI + TEST sets itself apart from the rest of the field with its additional health-boosting ingredients and tribulus fruit powder component. When you take this multivitamin, your sexual health is just the proverbial tip of the iceberg. Vitamin A (as retinyl palmitate), 5,000 IU: A vitamin which helps improve vision, increase muscle mass, and strengthen bones. Vitamin C (as ascorbic acid), 250 mg: Vitamin C is not just an effective remedy for the common cold, folks. It’s also a powerful antioxidant and heart health booster. Plus, vitamin A also helps shore up eye function and produce collagen (the protein found in connective tissue). Vitamin D (as cholecalciferol), 200 IU: This vitamin helps ward off free radicals, improve cardiovascular health, and strengthen bones and teeth. Vitamin E (as d-alpha-tocopherol succinate), 100 IU: Vitamin E acts as a powerful antioxidant, improves heart and eye function, and shortens recovery time. Vitamin K ( as phytonadione), 80 mcg: An ingredient which helps regulate blood clots, regulate immunity and digestion, and strengthen bones. Thiamine (as thiamine hydrochloride), 25 mg: Simply known as vitamin B1, this is a classic B vitamin which helps shore up heart health and ramp up energy levels. An awesome 1,667 percent of the daily value should go a long way. Riboflavin, 25 mg: Vitamin B2 helps increase energy levels and regulate the immune and digestive systems. You’re sure to reap these benefits from an impressive 1,471 percent of the daily value. Niacin, 50 mg: Vitamin B3 helps boost heart health and joint mobility, promote proper nerve function, and regulate blood pressure levels. Vitamin B6 (as pyridoxine HCl), 25 mg: A B vitamin which helps improve cardiovascular function, regulate the nervous and immune systems, and boost kidney health. An awesome 1,250 percent of the daily value is a sure bet. No doubt about it. Folic acid, 400 mcg: Vitamin B9 which helps quell anxiety, repair skin cells, keep free radicals at bay, boost heart health, and promote muscle growth. Vitamin B12 (as cyanocobalamin), 100 mcg: Another classic B vitamin which helps improve cardiovascular function and ramp up energy levels. You simply can’t go wrong with an impressive 1,667 percent of the daily value. Biotin, 300 mcg: Vitamin B7 helps improve hair, nail, and skin health. Plus, it helps repair muscle and keep inflammation at bay. Pantothenic acid (as calcium-d-pantothenate), 25 mg: Simply known as vitamin B5, this ingredient helps keep stress levels in check, boost the immune system, increase stamina, and improve heart health. Calcium (as calcium carbonate), 100 mg: GAT MENS MULTI + TEST is a so-so source of calcium at just 10 percent of the daily value. Iodine (from kelp), 150 mcg: An ingredient which helps regulate thyroid function, ward off bacterial activity, increase energy levels, strengthen teeth and hair, and keep nasty free radicals at bay. Magnesium (as magnesium oxide), 300 mg: A mineral which helps boost heart health, improve sleep quality, lower stress levels, and ramp up testosterone and energy levels. Zinc (as zinc oxide), 30 mg: This versatile mineral helps ramp up testosterone levels, improve sleep quality, strengthen bones, shore up immunity, boost brain health, and ward off free radicals. Selenium (as l-selenomethionine), 100 mcg: This mineral helps regulate immunity, keep free radicals at bay, and regulate thyroid hormone production. Copper (as copper gluconate), 2 mg: This mineral helps stimulate brain activity, increase energy levels, and boost iron absorption. Manganese (as manganese gluconate), 4 mg: Manganese helps regulate blood sugar levels, improve thyroid function, ward off inflammation, and boost digestion. Chromium (as chromium dinicotinate glycinate), 120 mcg: A mineral which helps keep bad (LDL) cholesterol levels in check, promote healthy blood pressure and blood sugar levels, and improve eyesight. Molybdenum (as molybdenum citrate), 80 mcg: An ingredient which helps ward off free radicals, strengthen teeth, and facilitate the elimination of waste products. Potassium (as potassium chloride), 50 mg: A mineral which helps regulate the nervous system, keep muscle cramping at bay, strengthen bones, boost muscle growth, and promote healthy blood sugar and blood pressure levels. Tribulus fruit powder ,500 mg: A flowering plant which helps improve sexual function, ramp up sperm count, and increase endurance. GAT MENS MULTI + TEST has one of the highest levels of tribulus fruit powder among multivitamins. Try it and see the difference. Alpha lipoic acid, 25 mg: A powerful antioxidant which also helps boost heart health, increase strength, and regulate neurological function. Inositol, 10 mg: This natural compound helps increase fat loss, promote healthy cholesterol levels, regulate nerve function, and boost skin and hair health. Choline (as choline bitartrate), 10 mg: This water-soluble nutrient helps improve memory, keep fatigue at bay, stifle free radical activity, and regulate cholesterol levels. Boron (as boron citrate), 2 mg: A mineral which helps boost heart health and keep free radicals at bay. Lycopene, 500 mcg: This red carotenoid pigment helps improve cardiovascular function, ward off free radicals, keep age-related macular degeneration and cataracts at bay, and protect the skin from the detrimental effects of excessive sunlight exposure. Lutein, 500 mcg: This carotenoid helps boost long-term vision, improve heart and skin health, promote healthy blood sugar levels, and stifle free radical activity. Vanadium (as vanadyl sulfate), 100 mcg: An ingredient which helps regulate blood sugar levels, ward off free radicals, and strengthen bones. Citrus bioflavonoid powder complex: These plant-derived compounds help keep free radicals at bay, utilize vitamin C levels in the body, boost circulation, and regulate immunity. Grape seed extract: An ingredient which helps boost heart health, boost circulation, regulate cholesterol levels, and ward off free radicals. Green tea leaf extract: This ingredient helps keep free radicals at bay, boost fat loss and immunity, regulate blood pressure levels, improve heart health, and quell anxiety. Spirulina powder: A blue-green algae which helps ward off free radicals, regulate blood pressure and cholesterol levels, ramp up energy levels, and boost fat loss. Blueberry fruit powder: A fruit which is known for its powerful antioxidant properties. Blueberries also help regulate the immune system, boost urinary tract health and digestion, and improve long-term eyesight. Cranberry fruit powder: This fruit helps regulate urinary, respiratory, and renal health, promote healthy cholesterol levels, and keep free radicals at bay. Wild yam root powder: This ingredient helps regulate hormone cholesterol, and blood pressure levels, strengthen bones, and increase energy. Wild yam also boosts sexual function – a perfect complement to GAT MENS MULTI + TEST’s tribulus fruit powder component. Papaya fruit powder: A fruit which helps ward off nasty free radicals, boost fat loss, and boost vision, digestion and immunity. Carrot root powder: Carrots have a reputation for improving long-term eyesight, which is true. However, they also help boost heart health, regulate blood pressure levels, blood sugar levels, digestion, and immunity; and ward off free radicals. Well, after a thorough analysis, we say this vitamin product is all that and more. Many multivitamins deliver on their promise, but come up short on the sexual function area. Well, when you supplement with GAT MENS MULTI + TEST, it’s like you’re taking a multivitamin and testosterone booster at the same time. How about an impressive 500 milligrams of tribulus fruit powder per two-tablet serving to get you going? It bears repeating: GAT MENS MULTI + TEST has one of the highest tribulus fruit powder levels we’ve seen to date. We guarantee you’ll experience improved sexual function (which is a part of men’s nature) and increased strength, muscle mass (especially when you take this multivitamin in tandem with a protein powder), and endurance. Long story short, if you’ve been killing it at the gym but have been faltering in the sack, this product is for you. Another advantage of buying GAT MENS MULTI + TEST is practicality – save yourself the hassle of buying a multivitamin and testosterone booster, folks. This product gives you the benefits of both products. Trust us. Aside from its awesome tribulus fruit powder component, GAT MENS MULTI + TEST’s other selling point is its additional health-boosting ingredients. We’re talking about its citrus bioflavonoid peel powder complex, grape seed extract, green tea leaf extract, spirulina powder, and the like. We guarantee these will improve your long-term health. On the flip side, these ingredients are part of GAT MENS MULTI = TEST’s Proprietary Blend – the manufacturer fails to break down the individual ingredient amounts. Like we also said, GAT MENS MULTI + TEST’s vitamin and mineral components are nothing out of the ordinary. We’re confident these ingredients will not only fill your nutrition gaps, but they will also provide your body with a ton of health benefits. Other pluses: we like the GMP (Good Manufacturing Practices) stamp of approval and the inclusions of vitamin D, vitamin K, chromium, and copper. Many manufacturers overlook the aforementioned four ingredients, but not the folks at Team GAT. On the other hand, when you take a multivitamin with GMP certification, you have the assurance GAT MENS MULTI + TEST has quality ingredients – no fillers whatsoever. Alas, GAT MENS MULTI + TEST isn’t perfect. Aside from its shady Proprietary Blend, this supplement’s potency is questionable – some customers say it didn’t work at all. That one had us scratching our heads, to be honest. Other consumers also said they experienced a “niacin flush” with this product – a burning and tingling sensation in the face and chest areas. We attribute that to this multivitamin’s 250 percent of the daily value for niacin (vitamin B3). Experts say it’s nothing to worry about – it’s just a sign one is starting to feel the effects of vitamin B3, an ingredient which dilates the blood vessels. Nonetheless, GAT MENS MULTI + TEST’s positives still outweigh the negatives – it’s worth a shot, folks. We agree with these claims. GAT MENS MULTI + TEST is a solid multivitamin which should live up to its billing. The manufacturer intended GAT MENS MULTI + TEST for healthy and active males who want to fill nutrition gaps, regulate immunity, achieve their daily fitness goals, and boost long-term health. GAT MENS MULTI + TEST has 250 percent of the daily value for niacin (vitamin B3), an ingredient which may cause “niacin flush” (a burning or tingling sensation in the face and chest areas) in some individuals. If this, or any other ingredient, makes you feel doubtful, please consult your physician before buying GAT MENS MULTI + TEST. Improves sexual function. Has impressive 500 milligrams of tribulus fruit powder per serving. Boosts long-term health. Look no further than its ingredients under its Proprietary Blend. GMP certification. Assures customers product has no fillers. Awesome. Has vitamin D, vitamin K, chromium, and copper. Thumbs up. Good reputation. Many customers have given this product high marks online. Practical. It’s like you’re buying a multivitamin and testosterone booster. Proprietary Blend. Manufacturer does not divulge individual ingredient amounts. Boo. Potency. Some customers say it didn’t work for them. Side effects. Niacin flush, in particular. So, if you’ve always wanted to buy a multivitamin and testosterone booster in one, you’ve found it. GAT MENS MULTI + TEST should give you the benefits of both supplements. It may not be a perfect multivitamin, but it should be worth at least a try. We recommend you give this one a shot. If it doesn’t work for you, there are a heap of other multivitamins out on the market.